My last house had a formal dining room that we rarely used. Our lifestyle in northern California is very laid back, and we would only use the dining room for Thanksgiving or Christmas if we happened to be hosting. Every time I walked past my dining room, I would think to myself "what a waste of space." It never occurred to me that my dining room could do double duty until I came across these rooms. 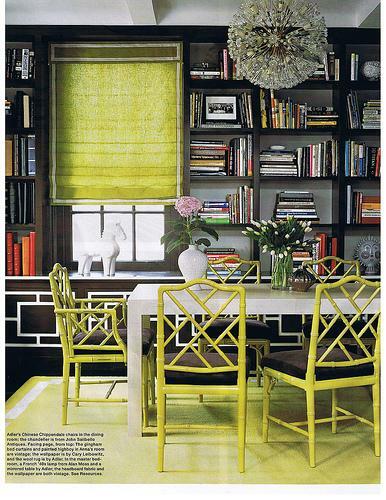 This is a room completed by Mica Ertegun of MAC II published in Architectural Digest. Not only is it a lovely dining room but it doubles as a library. There's something about walls of beautifully bound books that create a warm, cozy feeling. Also, books are a great conversation starter during dinner. Though this dining room has 3 walls of built in bookcases, all you need is a couple of bookcase to mimic this look. Here's a modern variation of the library dining room. Love the pop of yellow against the dark walls. 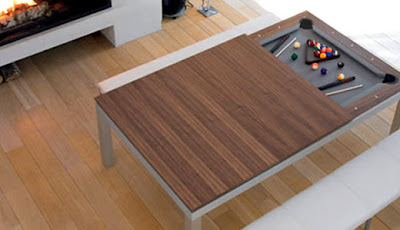 Convert your dining room into a billiard room by lifting off the top of this table. You can even use it as a poker table with the addition of a poker felt top. Full disclosure - my husband and I bought this table for our dining room a couple of months ago. Yes, it is stupidly expensive, but it is exquisitely designed, very beautiful and highly functional as both a dining and game table. We find ourselves spending more quality time with our friends at home playing pool and hanging out. This table has really changed the dynamics of the room and how we interact with friends. Costco sells much a more affordable versions of this table, tough not as good looking. If space is at a premium, use your dining room as an office. The dining table becomes a generous work surface. File cabinets can double as a buffet. Office furniture has come a long way, and you can find beautiful file cabinets that look like high end furniture. Pottery Barn has some great examples. If you're crafty and on a budget, you can customize generic file cabinets with beautiful wrapping paper. There's also office organizers pretty enough to be left out on display. Container Store has a great assortment to choose from.